Hatfield has had a variety of names and spellings over the centuries: Haetfeld, Hetfelle, Hatfeud, Bishop's Hatfield and even Cecil Hatfield. With the Great Wood providing timber and a home to abundant wildlife; streams and rivers for water, fish and powering mills; pastures for grazing livestock, Hatfield was, and is, a green and pleasant place. Its strategic position on the Great North Road from London partly explains the town's rich and diverse history. Hatfield has particular significance for people interested in Tudor (especially Elizabethan), Victorian, road, rail and aviation history. The discovery of Middle Stone age flints suggests Hatfield has been a site of human habitation for thousands of years. Hatfield's first confirmed mention in recorded history dates back to before the Domesday Book (commissioned by William the Conqueror in 1085 AD and completed the following year). 55 BC – Julius Caesar invades Britain (some consider the date to be 54 BC). However, the main Roman invasion came around 43 AD. Britain remained a part of the Roman Empire till the 5th Century (effectively ending in Britain around 410 AD). Little is known about Hatfield's history during this period. However, it is very close to the major settlement of St Albans and at least two Roman roads passed through. While a "fine white marble bath of Roman workmanship" was reportedly found near the gardens of Hatfield House. It is possible that a Roman building may have once stood on the high ground later occupied by the Bishop's Palace and / or Hatfield House. 680 AD – The Council of Hatfield (also referred to as the Council of Haethfeld or Synod of Hatfield / Heathfeld). Believed to have been held here but now considered to be have been at Hatfield Chase. However, opinions on the location and date of this important meeting can vary. c 970 AD – Given to the Abbotts, later Bishops, of Ely (whose patron St Etheldreda was later known as St Audrey) by King Edgar, it became Bishop's Hatfield. The parish of Hatfield was once the largest in Hertfordshire (the diocese of St Albans was only created in 1877). 1086 – Of the five listed in the Domesday Book it is the only one located in Hertfordshire (the actual name Hetfelle meant pasture or open land. In common with many places, in the early days when only a few people could read or write and there were changes in language, it has many variations of its spelling). Hatfield's entry shows a small settlement with two watermills and 55 people in various professions (one source suggests a population of around 300). 1538 – After King Henry VIII took a fancy to Hatfield the title duly passed from the Bishops of Ely to the Crown. The king used the Bishop's Palace at Hatfield as a nursery for his children Prince Edward and Princess Elizabeth (later King Edward VI and Queen Elizabeth I respectively). Another future Tudor monarch Mary (later Mary I) had earlier lived at Hatfield as Princess Royal until her mother, Katherine of Aragon, divorced the king in 1533. Mary was later declared illegitimate and she was reduced to a lady in waiting in the court of the infant Princess Elizabeth. Following his accession to the throne, King Edward VI later gave Hatfield to Princess Elizabeth. Lord Burghley (William Cecil) acted as her agent and managed her estates – the start of the Cecil dynasty's association with Hatfield. 1558 – Queen Elizabeth I received the news of her accession to the throne while sitting reading a book under an Oak tree in Hatfield Park. She appointed Lord Burghley as her Secretary (the formal office of Prime Minister did not exist at this time) and held her first court in Hatfield. On his death Lord Burghley was succeeded as Secretary by his second son (by his second marriage) Robert Cecil – later to become the first Cecil Earl of Salisbury (with his seat at Hatfield). 1608 – James I, son of Mary I, who succeeded Elizabeth I to the throne (1603) and retained Robert Cecil as his Secretary, took a fancy to Theobolds, the Cecil family estate in Hertfordshire, and gave Hatfield with its Old Palace in exchange (not exactly a fair exchange but he had created Robert Cecil as the Earl of Salisbury in 1604; invested him as a Knight of the Garter in 1606, and appointed him Lord Treasurer in 1608). Robert Cecil demolished most of the Old Palace (except for one wing) and used the bricks to build the Hatfield House (completed in 1611) that still stands today. He employed John Tradescant the Elder as his gardener. 1789 – James Cecil, 7th Earl of Salisbury is created as the first Marquess of Salisbury (a rank higher than Earl but below Duke). 1837 – Queen Victoria ascends the throne and her first Prime Minister was William Lamb, 2nd Viscount Melbourne. He served two terms as Prime Minister of Great Britain, and his family home was Brocket Hall – one of the manors of Hatfield, where he died in 1848. He is buried in the family vault at St Etheldreda's Church. Melbourne, the capital of the Australian state of Victoria, is named after him (although the family title is taken from Melbourne in Derbyshire). 1850 – opening of the Great Northern Railway (GNR) from London to York (with Hatfield as one of the original stops) meant the days of horse drawn coaches were numbered. Its arrival in Hatfield also resulted in the building of the first new town in Hatfield (virtually all traces of which were destroyed when they built the 1950s Hatfield new town). Later on branch lines were opened connecting Hatfield with Hertford and St Albans (The Alban Way footpath and cycle lane runs along the route of the latter). In its heyday, Hatfield Railway Station boasted of a steam shed and a turntable (even today, Hatfield's offset platforms are an unusual feature on the railways). 1885 – Robert Arthur Talbot Gascoyne-Cecil, 3rd Marquess of Salisbury, became Prime Minister of Great Britain for the first time (between 1885-1902 he served three terms as Prime Minister and four as Foreign Secretary). He was Queen Victoria's last Prime Minister. He died in 1903 and was buried in the family graveyard next to St Etheldreda's Church. World War I (1914-1918) – men from Hatfield served in all branches of the armed forces and saw active service in many key battles. Tests of the first tank were carried out in Hatfield Park. 1920 – Ebenezer Howard, founded Welwyn Garden City after having successfully founded Letchworth Garden City in 1903. Part of the land used came under Hatfield and was bought from Robert Arthur James Gascoyne-Cecil, 5th Marquess of Salisbury. 1927 – Boundary alterations separate Welwyn Garden City from Hatfield, reducing the size of Hatfield Parish. June 1930 – Flying began at Hatfield when the de Havilland School of Flying – is the first to take up residence at the newly built airfield. 1931 – The newly formed Iraq Flying Corps started its official flying operations with a flight from Hatfield to Baghdad. 1932 – The newly formed Egyptian Air Force flew home from Hatfield. 1933 – King's Cup Air Race is held at Hatfield, and won by Captain Geoffrey de Havilland. This premier aviation event was held here till 1938 (the last show before the war, which was won by Spitfire legend Alex Henshaw). London Aeroplane Club, originally from Stag Lane, moved its headquarters to Hatfield in late 1933. 1934 – The de Havilland Aircraft Company opened its new factory at Hatfield. The DH.87 Hornet Moth was the first prototype aircraft to make its first flight from Hatfield. It was followed a few months later by the DH.88 Comet Racer (pictured). The de Havilland Aeronautical Technical School (founded at Stag Lane in 1928) moved to Hatfield. It eventually became the Hatfield Polytechnic and exists today as the University of Hertfordshire. 1935 – Hatfield Garden Village built in response to the rise in demand for housing following the opening of the aircraft factory. June 1936 – SBAC Air Show (originally Society of British Aircraft Constructors) held at Hatfield. The 1937 show – also at Hatfield – was the last before WWII (the show resumed in 1946, initially at Radlett, and still exists but is better known as the Farnborough Air Show). World War II (1939-1945) – men from Hatfield served in all branches of the armed forces and saw active service in many key battles. The de Havilland DH.98 Mosquito made its first flight from Hatfield, which was a key manufacturing site. 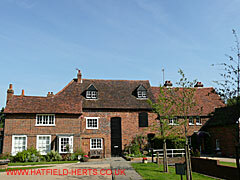 14 June 1948 – Hatfield designated as a New Town by designation order of the Minister for Town and Country Planning. 1960 – The de Havilland Aircraft Company is taken over by Hawker Siddeley. Initially kept as a separate company before being absorbed in 1963. 19 September 1962 – Hatfield Library opened by Sir Keith Sinjohn Joseph (2nd Baron Joseph of Portsoken, then Minister of Housing and Local Government). 1966 – Welwyn Garden City Development Corporation dissolved and responsibility passed to the Commission for the New Towns (which later became English Partnerships, which became part of the Homes and Communities Agency from 1 December 2008). 1969 – Hatfield College of Technology becomes Hatfield Polytechnic. 1973 – Welwyn Hatfield District Council formed alongside existing authorities, as a result of planned reforms by the national government (Conservative) to remove a tier of local government. 1974 – Hatfield Rural District Council dissolved and Hatfield ceased to be a district in its own right, following its merger with the Welwyn Garden City Urban Development Council to form Welwyn Hatfield District Council. 1977 – Hawker Siddeley became part of British Aerospace. 1983 – Further transfer of assets from the Commission for the New Towns to Welwyn Hatfield District Council. However, many properties had been sold leaving a legacy of fragmented ownership that came back to haunt the town 20 years later. 1986 – The Hatfield Tunnel carrying the A1M opened as the longest tunnel in the British motorway network. Since then vehicles pass under the town rather than through it, as they had done for centuries previously. 1987 – The BAe146-300 made its first flight from Hatfield – the last in a series of famous aircraft to have done so. 1988 – Hatfield Parish Council became Hatfield Town Council. 1990 – Howard Centre shopping complex opened in Welwyn Garden City, built by Tarmac Construction and owned by Slough Estates (ownership passed to Land Securities in 2004). It was to have a massive impact on the development of Hatfield a few years later. 1991 – The Galleria shopping complex opened in Hatfield as Europe's largest shopping mall. Owned by the Carroll Group (which went into receivership a year later. Ownership passing to Waxy Management, GE Real Estate, Lehmans Brothers Real Estate Partners until acquired by Land Securities in 2005). 1992 – The newly created University of Hertfordshire set up the Uno bus company. 1993 – Following a announcement in September 1992, all aircraft manufacturing ceased at Hatfield and the site was handed to the developers. 15 June 1993 – Central Resources Library opened at New Barnfield (site of the Hatfield School). 1996 – Slough Estates are awarded £48m in damages against Welwyn Hatfield Council on the grounds that the council had amended and kept secret its plans to develop The Galleria. Eventually, they settled for a lesser sum but this financial disaster put paid to plans to build a tram line along the route of the Alban Way (itself a former rail link), which would have linked St Albans, Hatfield and Welwyn Garden City. 2000 – Welwyn Hatfield Council teams up with English Partnerships to draw up plans for a £100m redevelopment of Hatfield town centre. 17 October 2000 – Hatfield train crash resulted in the deaths of four passengers and a massive shake up of the whole British railway network. 12 November - 21 December 2001 – Consultation on the development plans, included public exhibitions and a 3D model of the new town centre. Actual construction was expected to start in 2004. 25 January 2006 – Hatfield Town Centre Redevelopment Agreement launched. The three partners are Welwyn Hatfield Council, St Modwen Developments Ltd and English Partnerships. April 2006 – Welwyn Hatfield District Council becomes Welwyn Hatfield Borough Council. However, the new status only came into effect officially the following month after the appointment of the first mayor. 2008 – Robert Michael James Cecil, 7th Marquess of Salisbury, announced plans to redevelop Old Hatfield – the conservation area around Hatfield House. Europe's first digiplex opened at the Odeon Cinema at The Galleria. Welwyn Hatfield Borough Council announced that due to the credit crunch the planned town centre redevelopment is on hold. 2009 – Welwyn Hatfield Borough Council announce that a modified town centre redevelopment may go ahead. 2010 – Architects Haskoll unveil plans for the modified new town centre (scaled down scheme expected to cost £45m). 2011 – Hertfordshire County County (Conservative-controlled) announces that New Barnfield, Hatfield has been selected as the site for a waste incinerator. Hatfield House celebrated its 400th anniversary. Apart from the regular calendar of events, celebrations included one of the largest firework displays in the country, and a world record history lesson. New additions included a sundial feature in the West Garden, a fountain in the stable yard, and the opening of a rare breeds farm. Boundary Commission changes to reduce the number of MPs from 650 to 600 to result in Welwyn Hatfield parliamentary seat being expanded to include Hertford Rural North and Hertford Rural South electoral wards announced (Note 08.08.12: disagreements in the Conservative-Liberal Democrat coalition government means this may not go ahead). 19 May 2012 – The Red Arrows made a flypast in Diamond 9 formation at the South Hatfield Festival. 4 June 2012 – As part of the main national Diamond Jubilee celebrations a beacon was lit on the lawn in front of Hatfield House. 8 July 2012 – London Olympics 2012 torch rally passed through Hatfield. 3-4 August 2012 – Godiva (a 6m puppet) arrived – powered by Cyclopedia – as part of the Cultural Olympics. After a display at Birchwood, the next morning it travelled to Hatfield House before setting off on the next leg of its Coventry to London journey. 29 September 2012 – Airfields of Britain Conservation Trust unveiled their twenty seventh memorial (to Hatfield Airfield) at Ellenbrook Park. 24 October 2012 – Hertfordshire County County's Development Control Committee voted 11-4 to approve planning permission to build a 380,000 ton incinerator at New Barnfield (voting was spilt on party lines with Conservative councillors voting for and Labour and Liberal Democrats against). 4 December 2012 – Central Resources Library closed prior to its move to Welwyn Garden City. 28 January 2013 – Secretary of State Eric Pickles 'calls in' the HCC-Veolia New Barnfield incinerator ie. he ordered a public inquiry (later confirmed as starting on Tuesday, 10 September 2013 which would last twelve working days).